The scene is usually this: I come home from work exhausted. Kyle is working late. I stare into the refrigerator for 5 minutes looking perplexed and deeply sad, starving but immobile, desperate to plop down on the couch and see how many leather vests Dave Navarro will wear on tonight’s episode of Ink Master. I reach into the freezer, pull out a frozen pizza, toss it in the oven, and call tomato sauce a vegetable. Sometimes this is all I can do, and you know what? That’s totally fine. We all earn the right to cash out and splatter our midweek sweatsuits with pizza crumbs, to fall asleep on the couch at 8:30 using the dog as a pillow (anyone?). There are other days when my idea of self-care looks a little different. Today is Christmas Eve, and I’m home alone while my husband is at work. It’s dark, rainy, and gloomy outside. Frozen pizza won’t do! 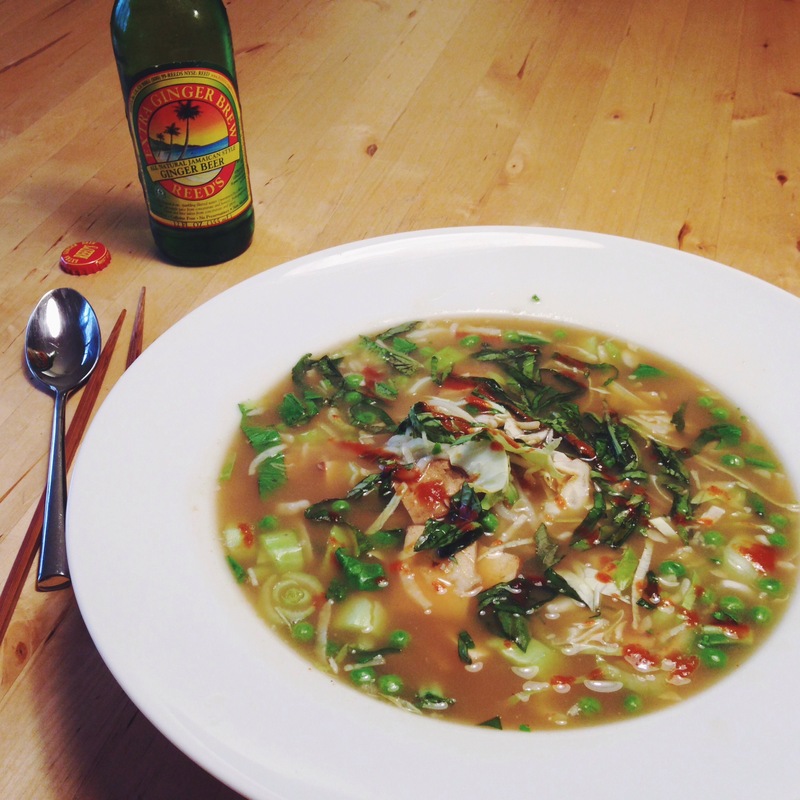 Today I needed something bright, fresh, crunchy: the opposite of a holiday casserole. Meet my new best friend: this giant bowl of ramen, filled with fresh rice noodles, broccoli, bok choy, and sliced tofu, topped with crunchy raw cabbage and a tangle of basil leaves, and doused in soy and sriracha. I had some (Trader Joe’s) miso ginger broth in the cupboard, which I heated on the stove. Once whatever broth you use is hot, add in the noodles of your choice. After 30 seconds, toss in whatever vegetables you have laying around your crisper drawer. Throw in some sliced tofu or leftover meat. Garnish with something crunchy (cabbage or sprouts) and definitely a fresh herb (some sad basil leftover from Monday’s lasagna). Season with soy and hot sauce to taste. Serve with an ice cold ginger beer. Eat in the den next to your not-yet-wrapped Christmas presents, a sleeping dog, and an episode of Sandra Lee’s Money Saving Meals. (The last part is optional). 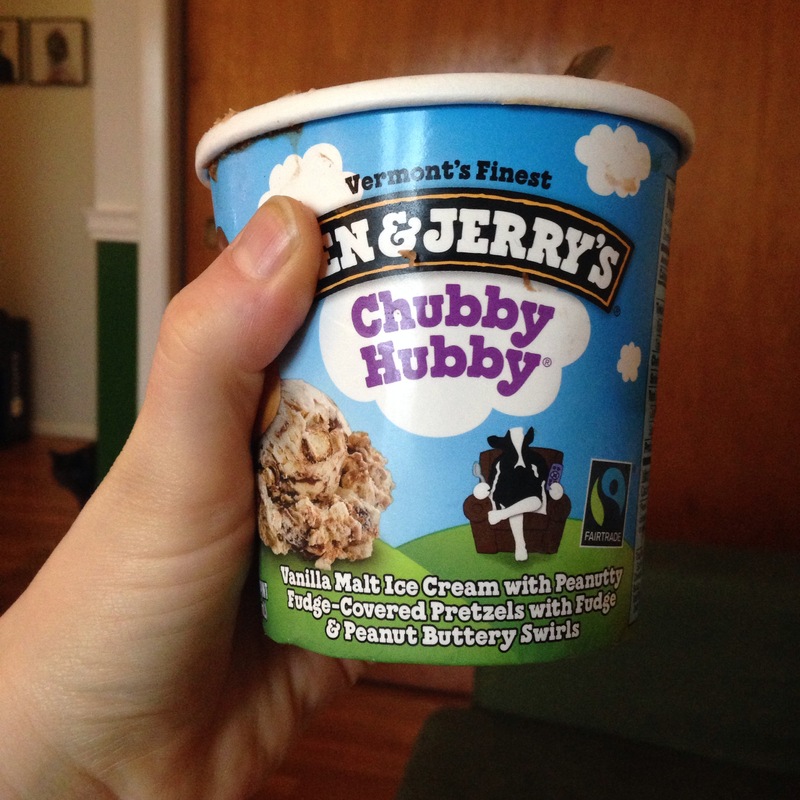 When you’ve finished your soup, grab a long-neglected carton of Chubby Hubby, scrape off the freezer burn, and finish it. Remember how many green vegetables you just ate. You totally deserve this.